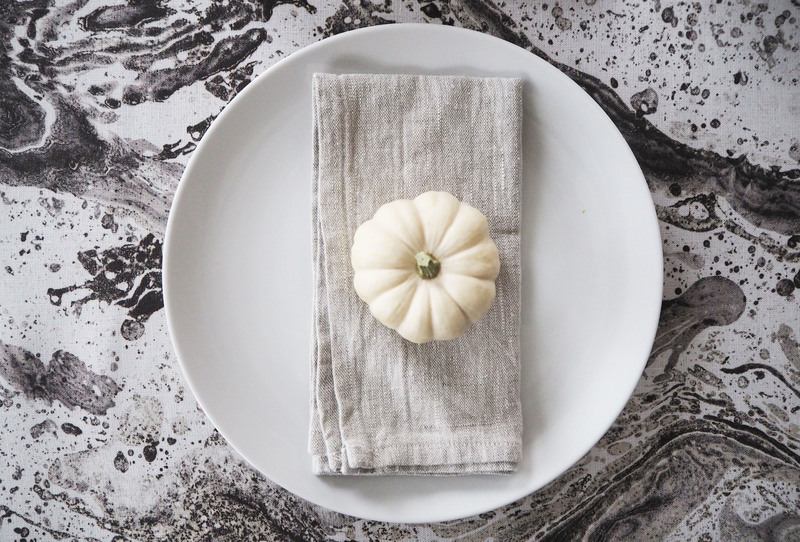 This year I have gone in a completely different direction for creating a tablescape for Autumn and I have to say that I really adore how this table turned out. 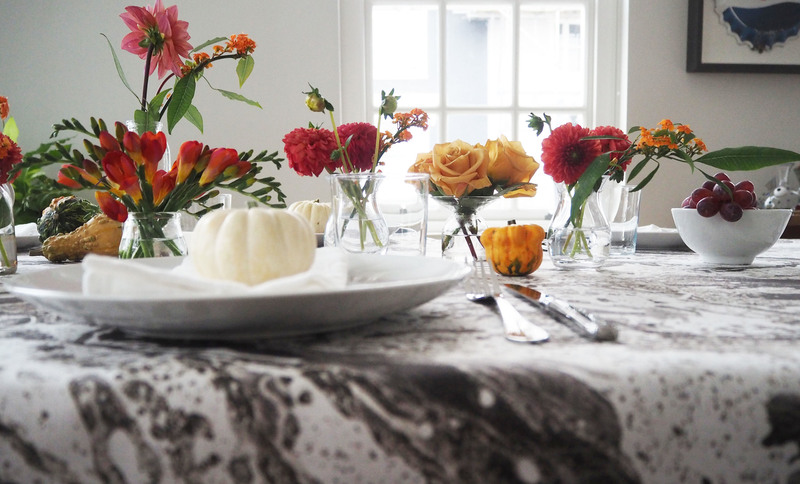 In the past I have loved using general fabrics as tablecloths, as opposed to buying an actual tablecloth from a store. I find it always give me more freedom to find a beautiful fabric that I actually love. Usually though I have gone for simple colors and really focused on the florals and objects on the table. 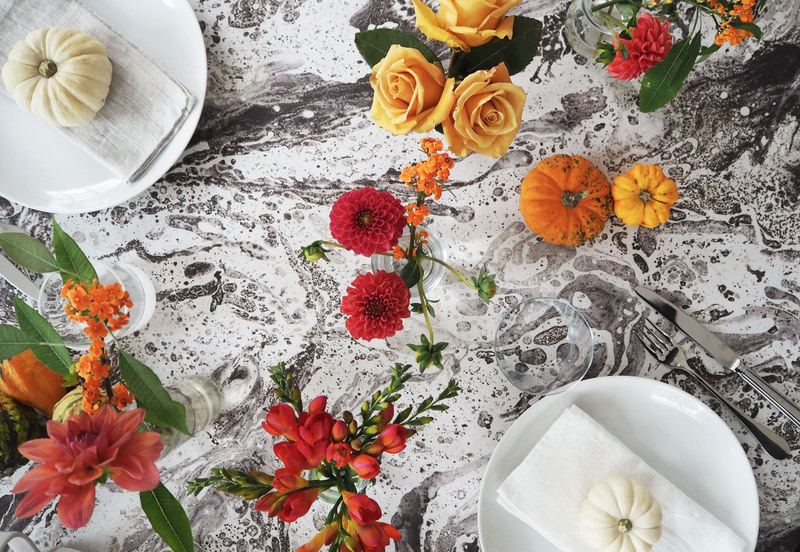 This year though I have decided to really have some fun with my table setting for an October get together at home. 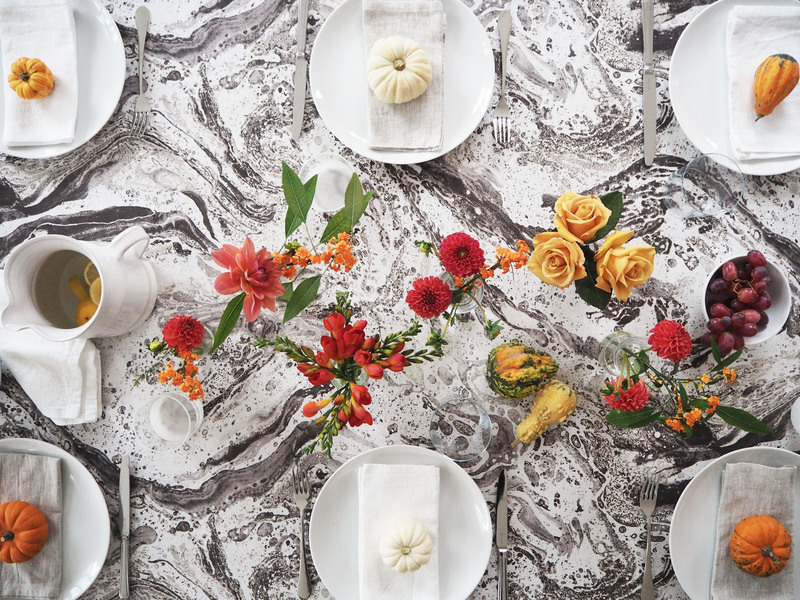 Since I have been a long time fan of the stunning fabric range from Earthed by William Clark, I decided to use a large piece of their Torrent fabric as the backdrop for my table. I used their monochromatic colorway and decided to combine lots of vivid Fall tones like orange, peach, gold and raspberry for the color of the flowers. I added pops of Autumn decor with the mini pumpkins and gourds (I especially love the white pumpkins added in this mix). I wanted to share this table because it is bold for me but I really enjoyed having fun with this look and also creating something that was a real head turner. I also couldn’t believe how gorgeous the Earthed fabric was (even more amazing in person). 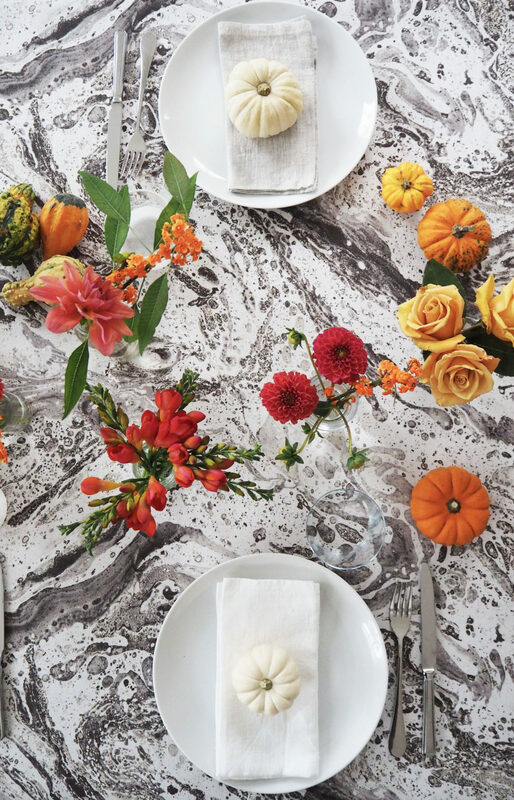 If you are thinking of having a party or dinner at home this Fall, this may give you some clever inspiration for your table. 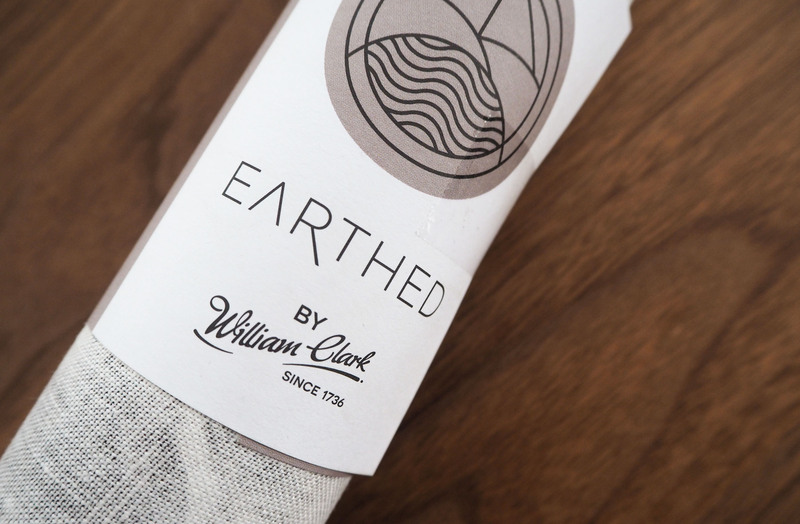 The fabric from the Earthed range by William Clark. I decided to go for bright pops on that beautiful monochromatic fabric. 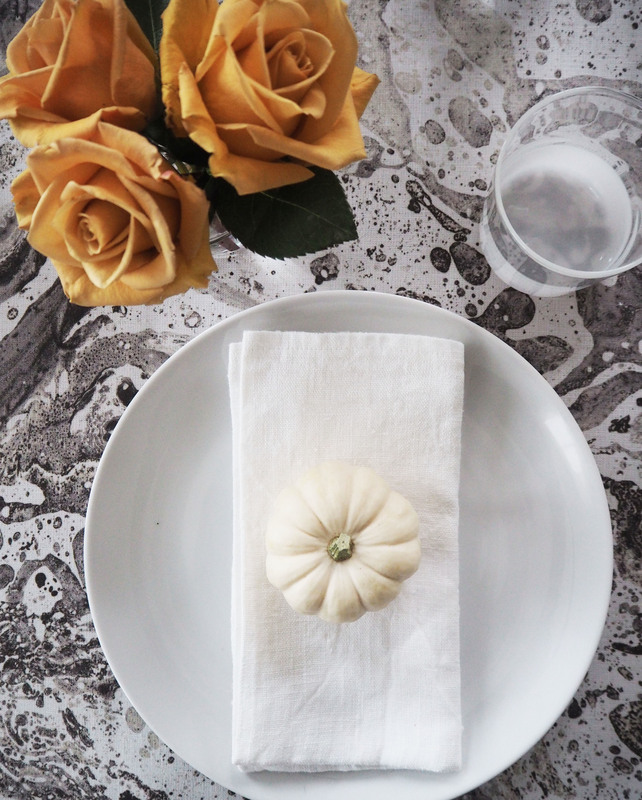 The simple touches of the mini white pumpkins were a favourite of mine. I like to use small mis-matched glass vases for the florals. The Earthed fabric pops so much in the background. I love it! Very unique and unexpected! I can see it for Christmas with floral pops of pinks and maroons too … beautiful.